At Arkansas Center for Ear, Nose, Throat & Allergy, our audiologists offer an exceptionally wide range of hearing aids to meet individual needs, from very basic technology to the most advanced digital solutions. These options sweep the full price range from the most economical – even reconditioned – to top of the line premium instruments. Technological advances in recent years have expanded our problem-solving capabilities in terms of helping our patients hear better. More features and flexibility means more options from which our patients can choose to meet their individual needs. This section will help to familiarize you with the styles and technologies that are available. It is important to remember that each individual has a unique hearing loss. Therefore, what worked for your friend or relative may not be appropriate or suitable for you. It is also important to understand that although hearing aids can be a tremendous help to patients, no hearing aid can restore normal hearing. • Purchasing two aids allows you to try listening through both aids, then just one at a time, to compare and decide what is best for your hearing and your budget. • Word understanding is better. • It is much easier to understand speech in background noise. • Sounds are more balanced and even. • You can locate the direction of sound or speech more easily. • You can wear both hearing aids at a lower volume (about 5 decibels lower) for greater comfort. • The ability to wear your aids at a lower volume makes acoustic feedback (squealing/whistling) less likely. • Having two hearing aids allows you to have at least one to listen through if the other is malfunctioning and must be sent for repair. This type of hearing aid is the least expensive category because of its simple analog (non-digital) circuitry and the fact that it is not computer-programmable. Patients are able to increase or decrease the volume, but typically fewer adjustments can be made by the audiologist to manipulate the sound of the hearing aid than with programmable or digital hearing aids. Usually the larger the size of the aid, the more controls can be fit on the aid by the manufacturer for our audiologists to help maximize benefit from the aid. This type of circuitry is typically described as providing the best sound quality. It offers the most flexibility for audiologists to work with to fit the individual’s loss much more precisely than non-digital aids. Many digital hearing aids come standard with directional microphones, which is one of the best features for listening in background noise. Other features include standard multiple listening programs for different listening situations, noise cancellation filters and may include feedback (whistling) management. Most digital hearing aids come standard with multi-memories. This advanced circuitry costs more than other types of circuitry but offers tremendous value due to the many advanced features and more sophisticated sound processing that can help you optimize your hearing potential. This exciting feature is available on many hearing aid styles (sizes) and levels of technology ranging from lower-priced analog (conventional) aids through premium digital products. This is the most effective answer to the problem of difficulty hearing speech in noisy environments (background noise). When the directional microphone is activated (through a switch, button or remote control), sounds from the front are emphasized over the room noise by anywhere from three or four decibels to seven or eight decibels, depending upon the type of microphone set-up used. This can help you hear the person you are listening to in a noisy situation much better, as long as you are facing that person. Some hearing aid wearers need additional help for optimal telephone use. Either they cannot hear on the telephone because of the degree of their loss or they cannot use the hearing aid well with the telephone because putting the phone over the aided ear causes squealing. These situations can be improved by the use of a hearing aid telecoil, which is a special feature that can be ordered by our audiologists if you need it. A telecoil is a special electromagnetic receiver that can pick up the sound of a telephone when the handset of the phone is held close to it. When the telecoil is activated (usually by flipping a switch or pressing a small button on the hearing aid) the hearing aid microphone is turned off. Then, holding the phone near the aid does not cause squealing and the phone can be heard more clearly. As noted above, a telecoil is typically activated by flipping a switch or pressing a button on the hearing aid but a switchless option is also available. This style of hearing aid consists of an earmold (which delivers the sound into your ear canal) which is connected to the hearing aid portion that sits or hangs over (behind) your ear. A well-fit BTE hearing aid is really very inconspicuous and can be hidden well under the hair. The actual hearing aid portion can often be purchased to match your hair color or skin tone, but are also available in fun colors, such as red, green, blue, yellow, and fuchsia. Today, many types of earmolds are available that blend in with skin tones. Earmolds can also be ordered in a variety of fun colors, swirls of different colors and even with glitter. BTE hearing aids are also commonly fit on young children because they are somewhat more durable than other hearing aid styles and because of ear growth issues (remaking just the earmold is less expensive than remaking an in-the-ear style hearing aid). Other patients prefer BTE hearing aids because they feel the controls (volume and on/off switch) are easier to manipulate. These aids are available in sizes from tiny to large to meet individual hearing needs and cosmetic preference. They are often surprisingly smaller than most people would expect. Larger BTEs are available, and are typically required when large amounts of power (gain) are needed (severe hearing losses). Other patients prefer BTE hearing aids because they can use the largest size hearing aid battery, which is easier to change and lasts longer. • BTEs can sometimes offer better sound quality due to the audiologists’ ability to manipulate more features that affect the sound the aid delivers to your ear [earmold style, earmold venting options (pressure relief in the earmold), tonehook options and tubing options]. For example, if you have good or normal hearing in the low pitches and significantly greater hearing loss in the high pitches, your audiologist may be able to fit your loss much more appropriately with a BTE aid. Your audiologist can use the acoustic modifications that are possible with a BTE aid to give you amplification where you need it and not deliver unneeded or unwanted sound in the low pitches where it is not needed. This can ensure optimal comfort and benefit that sometimes cannot be achieved as effectively or at all with an in-the-ear fitting. • When your aid must be sent for repair or servicing, a loaner BTE may be borrowed from our clinic and attached to your personal earmold. This style is custom fit to each individual ear and ranges in size from “full shell” (completely filling the entire “bowl” of the outer ear) to the tiniest style known as a “completely-in-the canal” (CIC) aid. You may recall that former President Clinton used a CIC, while Reagan wore a mini-canal. The other styles in between are the “half shell” and then going smaller to the “canal.” Each style requires a different sized battery. The smaller the aid you choose, the smaller the battery. Typically the smaller you go in size the higher the cost of the hearing aid. Sometimes the amount of hearing loss prevents patients from choosing the exact style they desire. For example, someone with a large hearing loss is not a good candidate for a mini-canal hearing aid. It is just not possible to get the amount of power needed from such a small device and feedback (whistling) would also likely be a problem. ITE style hearing aids typically are available in four different color shades. Sometimes when comparing the outsides of hearing aids they will look different. This is because not all hearing aids will have the same features: some will have a volume wheel, or some hearing aids will have a push-button that changes available listening programs or a switch for a directional microphone, and still other hearing aids may have a non-standard type of battery door. Other hearing aids may have removal handles, trim pots (colored dots that are actually screws that can be adjusted by your audiologist with a tiny screwdriver to change the sound quality of the hearing aid) or a switch (called a telecoil) for compatibility with a telephone. Because this style of hearing aid is custom made to fit each individual ear, ITEs are usually not recommended for children since their ears continue to grow until adulthood causing continual “remakes” of the hearing aid. CROS (Contralateral Routing of signal) hearing aids are designed for patients with one unaidable (“bad”) ear and one (“good”) ear with normal hearing or a mild loss. In this type of set-up, a microphone is placed over the “bad” ear (this looks like a BTE hearing aid). The microphone picks up sound, which is then delivered to the “good” ear via an earmold and BTE type receiver or an ITE type receiver (which may or may not provide mild amplification depending upon the hearing in the “good” ear). This system can be completely wireless, and although it allows patients to hear what is being said on the “bad” side it does not provide binaural hearing or true sound localization (ability to tell where sound is coming from). All sound is received by the “good” ear. This type of set-up is designed for patients with a “bad” or “dead” ear (either unaidable or deaf) who also have a hearing impairment in the better ear. A BICROS picks up sound from the “bad” ear and delivers it to the “good” ear, but this time with amplification to the better ear. The receiver on the better ear can either be a BTE or an ITE. Having a well-fit hearing aid is crucial when you have hearing loss. It is important to provide the best possible sound signal for your imperfectly-hearing ear to process and send to the brain. It is important, though, when purchasing a hearing aid to understand one important fact: hearing aids cannot restore hearing to normal or give perfect word understanding. They put louder sound into a damaged or abnormally functioning auditory system. 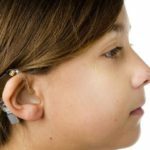 This gives a boosted signal which the damaged ear can better handle, but a damaged system will still send an imperfect signal to the brain for interpretation no matter how “high tech” the hearing aid. This is true no matter how optimally we adjust the hearing aid to the user’s needs. • Communicate with your audiologist if you are having any difficulty or need extra support in using, wearing or listening through your hearing aids. • Make a commitment to be patient and persistent with your hearing aid(s). • When possible, let people know what they can do to make it easier for you to hear. • Make sure that people have your attention before they speak. • If you join in a discussion, make sure you know the topic of conversation. It will help you to follow things better. • Practice “speech reading.” Always watch the person speaking, and take cues from facial expressions and gestures, as well as from lip and mouth movements. • Try to position yourself with the light source behind you. That way the person you are listening to will be easier to see, rather than in a shadow. • In restaurants, request a booth instead of a table. If you do not have a hearing aid with a directional microphone, try to sit with your back to a wall so there is less noise behind you.